"The Primatial Basilica of the Blessed Virgin Mary and St Adalbert is an ecclesiastic basilica in Esztergom, Hungary, the mother church of the Archdiocese of Esztergom-Budapest, and the seat of the Catholic Church in Hungary. It is dedicated to Saint Mary the Assumption and Saint Adalbert. It is the largest Church structure in Hungary and the third largest in Europe. It is 118m long and 49m wide. It has a reverberation time of 11 seconds. Its dome, forming a semi-sphere, is situated in the middle, and it has 12 windows. It is 71.5m high inside, with a diameter of 33.5metres, and is 100m high from outside, counted from the crypt, and is the tallest building in Hungary. The altarpiece (13.5 × 6.6 metres, depicting the Assumption of the Blessed Virgin Mary, by Michelangelo Grigoletti) is the largest painting in the world painted on a single piece of canvas. The basilica is also known for Bakócz Chapel (named after Tamás Bakócz), built by Italian masters between 1506–1507 out of red marble of Sütto", its walls adorned with Tuscan Renaissance motifs. It is the most precious remaining example of Renaissance art in Hungary. The huge crypt, built in Old Egyptian style in 1831, is today the resting place of late archbishops, among others, József Mindszenty. The building of the present church took place on the foundation of several earlier churches. The first was built by Stephen I of Hungary between 1001-1010 (as the original Saint Adalbert church), the first cathedral in Hungary, which was burned down at the end of XII century. It was rebuilt, but not too much remained of it, and was almost completely destroyed under the Tartar (Mongol) Invasion. It was rebuilt again in the XIII and XIV century, and a huge library was added, the second most significant one in the country. It was ruined again under Turkish rule, in 1543. 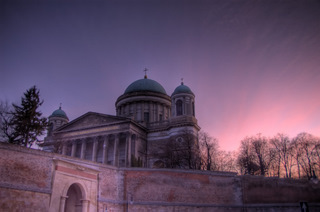 In 1820, the Archdiocese was restored and archbishop Sándor Rudnay decided to restore Esztergom's status as mother church of the country. The architect was Pál Kühnel and the lead contractor was János Packh. The foundation-stone was laid and work began in 1822. The Bakócz chapel was carefully disassembled (into about 1600 pieces) and was moved 20 metres away from its original location and attached to the new basilica. In 1838 Packh was murdered, so József Hild was placed in charge of construction. He completed it in Classicistic style. Under the next archbishop, János Scitovszky, the upper church was completed and dedicated on August 31, 1856. The 1856 consecration ceremonies featured the premiere of the Missa solennis zur Einweihung der Basilika in Gran (Gran Mass), composed and conducted by Franz Liszt. The final completion of the cathedral took place twelve years later in 1869.